Antique Area rugs are an indispensable interior design accessory. Grand rooms and private spaces can both benefit from the addition of a stylish old area rug. The cushiony textures, balanced proportions and carefully selected colors are the secret ingredients that can tie any interior design together. From luxurious traditional rugs, to artful contemporary carpets, a fabulous area rug can function as an arresting conversation piece. It can stand out as a focal point or become a neutral feature that connects separate elements within a space. Area rugs are available in every size, shape, style and color palette imaginable. Designers and do-it-yourselfers only need to jump in to experience the tremendous variety and stylistic breadth of contemporary and traditional area rugs. The start of the weaving industry began with the domestication of animals. We used their hair (wool) that we sheared. We did not have to kill them anymore, just shear them on a regular basis. Thus, they continued to produce wool, for our weaving needs. Antique Area Rugs are just another facet of our evolution. What did we do before we started weaving rugs? We killed animals and used their hides. We used them for warmth and floor coverings. Whatever the skins looked like was what floor coverings looked like. Once we began to dye the wool, the commercial weaving of antique area rugs began. We produced a more colorful product and used our artistic talents to design them. First, we wove rugs for our personal use. Then, it became an industry. This industry continues in much the same fashion even today. The term antique area rugs refers to rugs that are at least eighty years old. Limited in numbers, antique area rugs will become more rare. The twentieth century ushered in the industrial era. From this point on, the economy became more global. This resulted in more Western influences in the Middle East. During this period, the uniqueness of the antique area rugs began to wane. During the early 20th century, economic instability began to set in. Productions became more commercial. They also became less expensive (and as a result, far less appealing). This resulted in the degradation of the rug production throughout. Designs, colors, overall quality and appeal all took a back seat. The manufacturers just looked to lower costs. 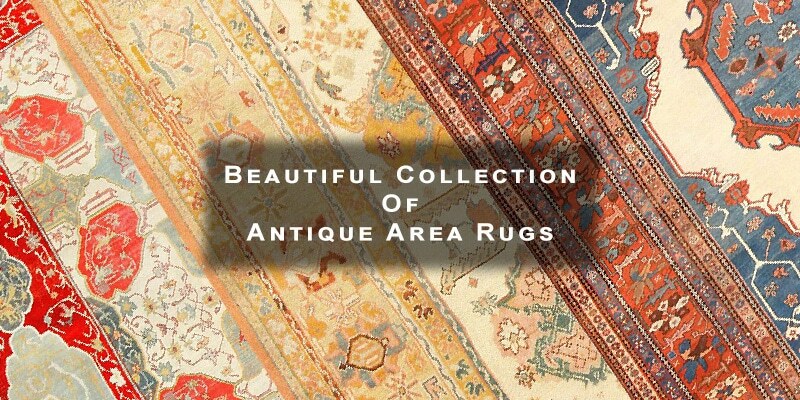 True antique area rugs predate, for the most part, the advent of mass production. A little known fact that I would like to talk about is price. Despite the difference in quality between the antiques and new, many older area rugs might be less expensive than the new ones. The antiques have unique assets compared to their newer counterparts. For instance, antique rugs with hand-spun wool, and natural dyes, have a more luminous surface. New area rugs will never have the patina as the antiques. New rugs have no intrinsic value. Therefore, antique area rugs, are decorative items and solid investments. Quality and imperfections are more subjective aspects for judging antique area rugs. Some buyers of antique area rugs might be less inclined to acquire area rugs that are not extremely fine. These quality driven antique area rug buyers would more than likely gravitate towards the workshop city rugs. For the most part, these city production area rugs will generally be perfectly straight and the colors and design are consistent throughout. Others might appreciate the personality of village rugs. Village weavers confront us every time she or he inserts a willful twist, change of color or pattern. Therefore, the weaver is alive in the antique area rugs that he or she created. The history of antique area carpets and rug weaving is complex and fraught with lingering scholarly questions. While the recent history of artisanal rug weaving is well documented and while certain areas have kept reliable historical records, there is in fact little consensus regarding the genesis of the craft. Most people would not be comfortable making an educated guess as to the origins of rug production. That said, it is certainly true that most people in the Western world associate the earliest antique area rugs with the part of the world that we describe as the Near East. Indeed, rug weaving has been an important cultural practice in many Near Eastern countries for centuries. However, the academic general consensus, while far from unanimous, suggests that this region was not the birthplace rugs, despite its long history of rug production. In fact, the incomplete historical record of rugs does show us that rug weaving was a practice that was independently developed by a myriad of peoples across the world. The record becomes especially shoddy when it comes to the history of knotted or pile rugs; while it is an established historical fact that the urban centers of the great Near Eastern empires were the commercial centers of rug production throughout the Medieval Era, it is practically just as well established that these places were not the first to weave knotted or pile rugs. To find out more about the genesis of the knotted carpet, one must venture into prehistory, when most of mankind lived a nomadic existence. In their most basic form, rugs function today much as animal hides and skins functioned for our nomadic ancestors. While nomadic people utilized animal skins for a variety of functions for centuries, it is relatively unclear precisely when people began to sheer the fur and wool from certain animals to use in weaving. Naturally, the advantages of sheering over killing an animal are enormous. A dead animal yields a very finite amount of hide while a living animal that was sheared, offers a practically limitless supply of material. This simple but immeasurably important development in the history of human evolution would have naturally resulted in our nomadic ancestors finding themselves with more resources than they were accustom to having. As such, these nomadic peoples were now able to experiment with wool and other similar materials in ways that were previously unimaginable. The relatively bright wool given by sheep was well suited for dyeing. That is precisely what the earliest rug makers did. Plant materials, insects and a variety of other natural materials were all used to extract color. These colors were then applied to the wool to create the first rugs with patterns and culturally significant symbols. While this general idea is understood to be the most likely explanation for the earliest antique area rugs, it remains unclear where precisely this development would have first taken place. It is exceedingly unlikely that this would have happened in the Near East before it happened elsewhere; after all, early, nomadic humans were subject to their environment in a way that it is difficult for modern people to fully imagine. Therefore, it is unlikely that those living in the relatively warm region of the Near East would have seen the need to develop this technology. Meanwhile, there is some evidence in the archaeological record to suggest that the earliest pile rugs may have been woven further to the east… considerably further. It is the High Altai Mountains of Siberia, in modern day east-central Russia, that seems to be the most likely birthplace of the pile carpet. The earliest human inhabitants of this area were in fact nomadic. Unlike their cousins in the Near East, these people had a vested interest in developing new methods for keeping warm. Over time, the peoples of the High Altai Mountains began to become very invested in rug production and were soon adorning their rugs with distinct and symbolic patterns. 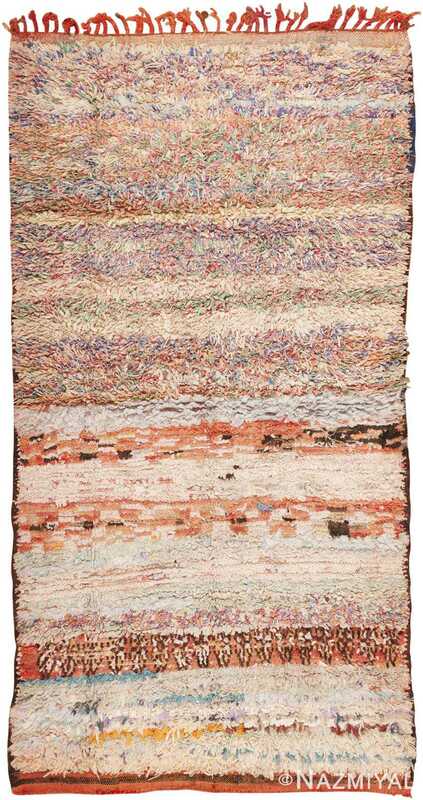 The earliest reliable records suggest the High Altai peoples were weaving pile rugs as early as 600 years before the common-era. The best evidence for this hypothesis is attributed to a series of excavations carries out by Russian archaeologists at a pair of locations in the High Altai. Those sites were the tombs of Bash-Adar and Pazyryk in southern Siberia. At Bash-Adar, a partial fragment of a pile rug was discovered. This simple, undecorated rug fragment was carbon-dated to the surprisingly early date of 600 B.C. Meanwhile, a considerably more headline-grabbing discovery was made at the tomb of Pazyryk. There, a largely intact pile rug was discovered encased in ice. This ancient antique area rug, which is widely referred to as the Pazyryk rug, dated to the fifth century B.C. While initially in a very distressed state, the frozen rug was eventually carefully and painstakingly restored – a process that revealed a truly remarkable ancient area rug. Complex detail work appears throughout the remarkable antique area carpet. A pattern of squares graces the center, with each square decorated with floral detail work. Woven into the borders are a series of further floral details, as well as meticulously woven griffins and a procession of horsemen. The colors are as impressive and feature shades of red, blue, green gold throughout this remarkable composition. This astonishing level of detail and color, as well as an impeccably fine weaving technique, has led many scholars to conclude the Pazyryk carpet must be Persian in origin, rather than the work of a band of Siberian nomads. This disagreement is the source of most of the academic disagreement regarding the genesis of hand knotted or pile rugs. Also excavated at Pazyryk, were a smattering of ancient Persian textiles that were discovered in addition to the Pazyrykcarpet itself. Does this evidence mean that the Pazyryk carpet is of Persian origin itself? Or does it mean that it is the result of the Altai nomads attempt to reproduce something that they found beautiful? There is as of yet no fully agreed upon answer. However, there is evidence to suggest that Pazyryk carpet was in fact a local creation, woven by the Altai nomads. More specifically, it is the fallow deer that are woven into the rug that leads some expert to believe that is was in fact a locally produced piece. These animals are neither indigenous to Persia, nor were they a common motif in Persian textiles from this time. Rather, these deer are common in other artistic media from the High Altai region. Further, the wool and dyes that make up the Pazyryk carpet seem to be local to the High Altai region as well. Thus it is likely, but far from certain, that this particular rug was in fact woven by the nomadic peoples of the High Altai Mountains and not by the Persians with whom they evidently enjoyed trading. Indeed, there are numerous examples that support the hypothesis that the weavers in this part of the world (the Russian Far East) were influenced by the weavers of the Near East. Ample archaeological evidence suggests that it was perfectly common for those weavers outside of Persia to weave rugs in imitation of the style. There is an enormous gap of just about one thousand years between the weaving of the Pazyryk carpet in the fifth century B.C. and the reemergence of knotted rugs in the historical record which date back to the fifth century A.D. in Roman occupied Egypt. 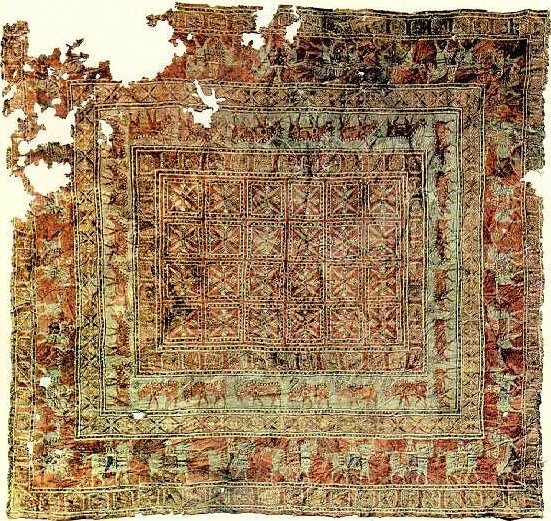 Meanwhile, a scattering of evidence suggests that area rugs were woven during this long span of time in places such as the Caucasus and Central Asia. Further, the archaeological record suggests that nomadic tradition of weaving looped carpets proliferated from the High Altai Mountains into China and Tibet, where the craft was modified. Though the precise genesis of the art of weaving rugs is unclear and the historical record spotty, there is in fact a good body of knowledge concerning the early days of this craft. What is known, is that rugs have been an important part of human history for millennia. Part of the nature of the academic struggle to understand the origin of rugs lies in the fact that people have most likely been weaving rugs since before they were writing. Antique area rugs represent a unique development in human culture, and offer some of its greatest mysteries and delights.